The adage, “Good fences make good neighbors has been around for just about as long as neighbors. But, is it true? "Good' is a subjective term, influenced by the emotions of the parties involved. Today we’re going to look at some conditions which make the adage true. Then some conditions which make it false. One of ours! A very low chain link fence keeps the dog and kids safely inside the from yard. We don’t have to worry so much about if the cow is in the corn anymore, but when a dog runs loose in the neighborhood, knocking over trash cans and doing his business in the neighbor’s yard, expect some backlash. A fenced-in pet promotes neighborhood peace when it contains animals. Small children on the loose are nothing short of a terror to neighbors and passing motorists. A fence in tip-top shape offers value and brings up the property value. A poor fence condition reflects poorly on the entire block, bringing neighborhood blight. When it’s time to build a new fence, a pretty one is always preferable. Pamela Steber, a site hostess for Habitat for Humanity, says, “As soon as we put the (temporary) fence up with the sign that the property will be used to build a Habitat house, the other homeowners in the neighborhood start making improvements to their own homes in anticipation of the new neighbor. Is it house pride? Or are they worried that building inspectors will notice their ugly violations? She says many do it in anticipation of an increase in their home’s value, as Habitat homes often reduce neighborhood blight. Your neighbors might love you, but that doesn’t necessarily mean they want to see your kids fight with one another, or watch a barbecue or pool party if they weren’t invited. A homeowner in Port Angeles, WA, angry over the chain link fence erected by his neighbor which made it hard for him to maneuver his logging equipment onto his property, went on a rampage with his bulldozer, wrecked three houses, damaged another, and shut down power to approximately 1,000 homes. He was eventually fined $300k. If an existing fence on a boundary line needs to be repaired, sometimes neighbors will feud over who is responsible. Ordinances vary, but usually, if a fence encloses a neighbor’s entire property, he will be accountable for it. However, if both parties use a fence, they are obligated to share in the repair of it. A spite fence is a deliberately ugly fence erected by a homeowner to spite a neighbor. If it’s incongruent with the design consistency of the neighborhood, useless, exceed height regulations or other nonconformities. 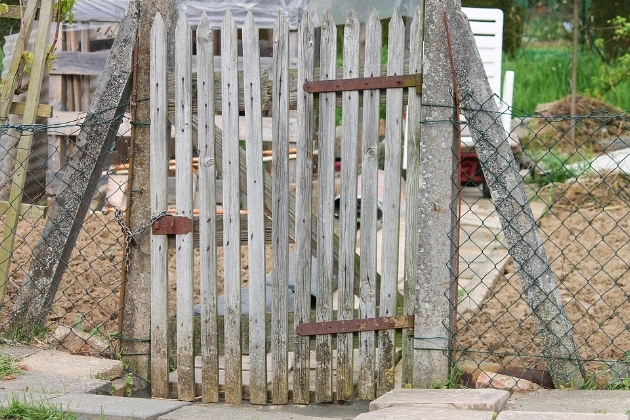 Permits are designed as a safeguard against incorrectly or poorly constructed fences. If a homeowner adds a fence or even replaces an existing fence, they must have a permit from the city to do so. Most homeowners find this an upsetting part of the process, but it ensures that the new fence is up to code, safe, and protects the homeowner as insurers may not pay for damage caused during construction if a permit wasn’t issued.